Most of the talk about drones has focused around quadcopters. Parrot has a fair number of those, like the Bebop 2, but the Disco is a different proposition, taking to the skies as a fixed-wing drone. In reality there's been no shortage of those, from balsa wood radio controlled gliders to small-engine model aircraft. However, the Disco aims to give you the simplicity that quadcopter flyers are used to and all the connectivity that modern devices should offer. The Parrot Disco is mostly constructed from expanded polypropylene, stiffened with carbon tubes, giving it a weight of 750g. Most of the weight is centred around the middle of the Disco, where there's a top removable section to give you access to CHUCK - the brains that provides the drone's autopilot capabilities - as well as the battery compartment. There's a single two-bladed propeller on the rear which is folding, meaning that it folds up when it isn't spinning, for example when it lands, so the blades don't break off. There's a camera in the nose and on the top you have a Pitot tube (measuring airspeed), also housing a coloured LED to show you the status of the Disco. It's also loaded with sensors and a ground camera to feed in information that the Disco needs for flying. The Disco is basically all wing, providing plenty of lift. Standing holding the drone, you can feel the wind lifting it, so it takes little effort to actually fly - although the minimum speed for stable flight is 18mph. The wingspan is 1150mm and the length is about 580mm. Fortunately the wings detach from the body to make it easy to pack away. This isn't as easily portable as a drone like the DJI Mavic Pro, more a case of pulling off the wings and putting them in your car, rather than folding it up and putting it in a bag. Then you have the Skycontroller 2, which offers a contoured grip not unlike an Xbox controller, but with the Mimo Wi-Fi transmitter on the front in a slab. It all feels comfortable and solid and offers options to connect a phone or tablet to view live from the camera, or to connect to a headset for a first person view. One of the appealing things about a quadcopter is how easy it is to launch. You turn it on, turn on the controller and that's about it. A plane needs forward motion to give it lift from the wings so getting into the air presents a different problem. Fortunately, Parrot has made this really simple. There's a launch button on the Skycontroller 2: holding the Disco by the leading edge of the wing, you press this button, the propeller spins up to speed and after about 10 seconds, you'll feel the Disco trying to pull away. You then toss it toward the sky a little like a frisbee and off it goes. We mentioned CHUCK previously - that's Control Hub and Universal Computer for Kit - this is the brains that ensures that the Disco then climbs and circles at 50m altitude, ready to be flown: you don't have to manually control the Disco as it takes off, you basically just have to throw it into the air. CHUCK lets you set limits, like minimum and maximum altitudes and a geofence range, so that there's some automated boundaries to your flying. Launching is easy, a single person job, so if you have any doubts about that aspect, then fear not. You can also easily put the Disco into a holding pattern, where it will fly loops with a 50m radius. This means you can leave the controls, have a cup of tea, take your coat off or whatever without the Disco flying off over the horizon. The Disco is about flying. It's not about hovering, which is the immediate appeal of a quadcopter. There's none of that gentle levitation, smoothly rising from the ground to reveal the jaw-dropping vista, but if you've ever wanted to buzz the tower Top Gun style, there's no better way to do it than with the Disco. The controls are simple and intuitive, the right stick controlling pitch and roll, changing ailerons to move the Disco through the air. The left stick controls the speed, you have to push it forward to accelerate to a maximum speed of about 50mph, or you can pull it back to slow to 18mph, the slowest speed it will fly. Leaving the left stick in the neutral position adopts an average speed of 24mph. All this time, the Disco will keep itself stable, accounting for wind, so it's easy to fly. If you hit one of those geofence boundaries, the Disco will turn itself away, rather than flying off out of range. Compared to a quadcopter the Disco is relatively quiet and it comes with a big flight time advantage, with 45 minutes on a single charge. The downside is that the Disco isn't really designed quite like a mobile video platform and won't give you those hovering shots. It can fly along the beach, it can soar through valleys and with a little practice, you can execute those low level flybys too, but you won't get those selfie opportunities or follow-me functions of other drones. This is for fun, rather than for filming. Landing is also easy, as is recalling the Disco, because it has a built-in GPS and will return to where it launched for you and it will also automatically land, although naturally, you need space to descend. Landing really just need you to descend and press the landing button. This will then use all the information from the sensors, descend to a height of about 6m and then cut the power. It uses a reverse thrust on the propeller and plops onto the ground. With practise, you can get it landing pretty close, flying it directly towards yourself, then hitting that landing button at the right moment. One of the great features of the Disco is the Cockpitglasses that we mentioned earlier. These come in the box with the rest of the package and are similar to any number of VR headsets out there. You slip your phone into the front in a caddy and via the FreeFlight Pro app and a USB connection to the Skycontroller 2, you'll then be able to view a live feed from the Disco's nose camera. That really puts you into the action, seeing what the Disco can see and if you ever had any fantasies of flying like a bird, then this first person view gives it to you. The quality of this footage will vary depending on a number of factors, although it can technically stream at 720p. If you have a large phone with tightly packed pixels, like the Samsung Galaxy S7 edge, you'll get better visuals than lower PPI devices like the iPhone 7. The further away the drone gets the more likely you are to see a breakup in that feed, but for most flying, it's fun, very immersive and gives you a good look around. You can fly viewing through the headset yourself, or you can have one person piloting and another spectating for the ride. If you don't fancy viewing through the Cockpitglasses, there's also the option to mount a phone or tablet on the top of the Skycontroller 2. Connecting in the same way via USB, you then have the option to glance at the controller to see what the Disco is seeing, while also being able to keep an eye on the drone in the sky. There's also a see-through mode that uses the rear camera of your phone to let you see the rear world. Like all VR devices, viewing the Disco's bird's eye view in flight can induce some motion sickness, so there's an easy real world escape. Aside from providing that video feed, connecting a phone or tablet to the Skycontroller is also how you change a number of settings to govern flight via the apps. That's how you set any parameters; you also get the option mark out a flightpath, if you want your Disco to fly along a particular route, perhaps for a recording you want. For many, the point of a drone is to record video from places you'd never be able to reach. For the Disco, things are slightly different, but you still have 1080p video offered from that nose camera. The camera is electronically stabilised on three axis and from what we've seen, it will give you some nice stable video. What we haven't yet been able to assess is the quality of that video. With companies like DJI really pushing the video capabilities and GoPro providing a platform for their own action cameras with the Karma drone, the competition in this area is fierce and in reality, those platforms are better for filming and offer more capable cameras. Parrot typically doesn't give you quite the same quality of results at 1080p as some of its rivals, but on the Disco, perhaps that's less important: you're less likely to be using this as a video platform, but at the same time, for £1,149, you've got a right to expect a lot. Everything you record is saved to the internal 32GB storage and yes, you need to download those files from the Disco, so there's no option for kamikaze filming. As we said, we haven't had the chance to fully assess the quality of the video results from the Disco, but the demo footage we've seen is certainly unique: 50mph in flight still gives you some unique perspectives. The Parrot Disco joins a growing number of drones that let you take to the sky and let you record everything as you do it. Unlike some of the more serious drones that have garnered a lot of attention, the Disco perhaps better lends itself to flying for the sheer fun of it. Sure, flying a quadcopter is fun, but in many cases, people are using them for filming in unique places, rather than just playing. At £1,149, the Parrot Disco is more of an executive toy, but we're impressed with the skills it has, the ease of flight and the options. 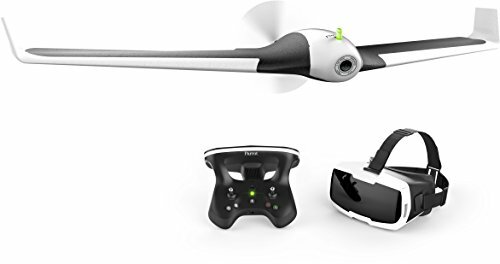 That cost is also somewhat justified by getting everything in the box, giving you a range of options to fly, film, view, entertain in a range of different ways. The Parrot Disco is fun and probably the closest you'll get to living out your Top Gun fantasies, if you can stretch to that price. The Parrot Disco is available to buy for £1001 on Amazon right now.